“You have to connect with your audience”. It’s a sentence you can read in almost any book about public speaking or hear at any training session. You want the audience to get involved. Why do you want the audience connection? The books and the trainers are right. It’s good to get a connection with the audience. Once you have the connection, the audience is much more inclined to believe what you are saying. They trust you, so they will be more open to you. If they don’t trust you, your story, no matter how good, will not “do” anything. It won’t “live” and the audience won’t remember your important messages. I always try to find the connection with the audience. Sometimes that is easier said than done. But I try. At a conference a few years ago, I tried out something new. I asked my audience for help. Let me explain. My talk was about Understanding your audience using data-driven marketing. It’s a topic I speak about more often and help businesses with. As a speaker, it sometimes can be difficult to get a grip on your audience. They always come from different backgrounds. So they will perceive your talk in different ways. In this case, I wanted to make an effort to understand my audience. That’s why I asked my audience for feedback. Right there and then. Asking for feedback is difficult. When asked, most people won’t tell you the truth. Or they keep it too simple: good, medium or bad. This doesn’t help me much to understand what they are taking away from my talk. So I asked the audience for their notes. Every audience is always making notes. On their computer, tablet or on paper. I decided I wanted to see these notes. 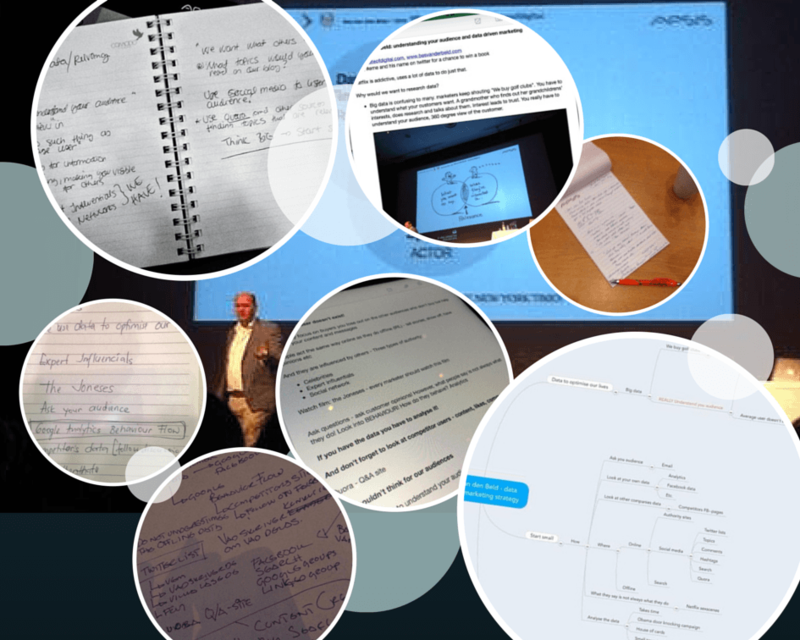 So I asked the audience to tweet out a picture of their notes after my session. I knew that this was tricky to do in Sweden. The audience in the Nordics is often a bit more reserved than somewhere else. They are knowledgeable but less interactive. In this case, the result was great. I got regular tweets with feedback and feedback in person afterward. And even better: I got pictures of the notes from some nice and helpful people in the audience. The audience understood my message. The message was that we need to make a bigger effort to try and understand our audiences. People understood the different groups you need to split up your audiences in. The audience ignored Social Media platforms like FB-groups, G+ and Linkedin in the notes. Some nice learnings there for me. I already knew about some of them. But there was some refreshing new information. For me, it was a success. And somehow (but I haven’t checked that) I think this helped the audience as well. They will hopefully look at their notes in a different way.